Pentagon leaders announced last week that they were rescinding the 1994 Combat Exclusion Policy that kept women out of ground combat units, raising a host of questions about what will change for rank-and-file service members. 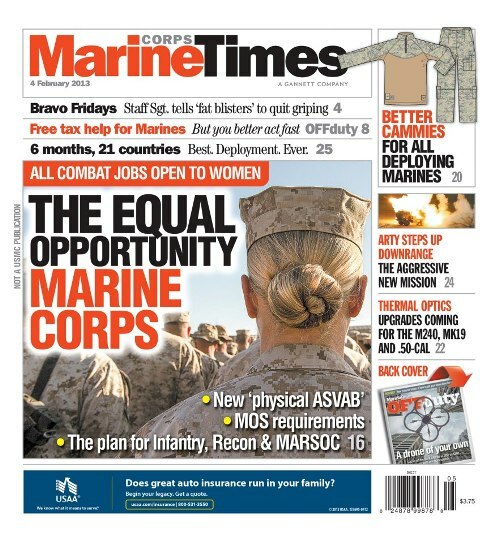 This week, Marine Corps Times addresses many of those concerns. Our cover story is splashed across four pages inside the magazine, and includes interviews with Lt. Gen. Robert Milstead, deputy commandant for manpower and reserve affairs, Sergeant Major of the Marine Corps Mike Barrett, and other senior leaders. By now, it seems safe to assume that nearly all of our readers are aware of the announcement Defense Secretary Leon Panetta and Gen. Martin Dempsey, chairman of the Joint Chiefs, made on Thursday. Therefore, I took a decidedly second-day approach to the story. I asked about what the Corps will do this year to prepare, which military occupational specialties will be affected and how the service will go about deciding what to keep open to women. This week’s issue also has a flashy spread outlining what the Corps’ next generation of flame-resistant uniforms will look like. Staff writer James K. Sanborn addresses why the new version will be better than the existing Flame Resistant Organizational Gear, or FROG.